Stop storing your bread in a grocery bag which makes your kitchen cabinet messy and your bread moldy. 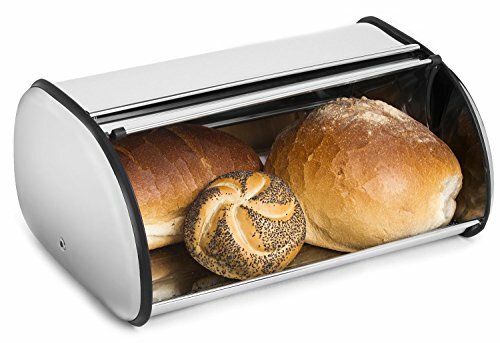 By using this "Greenco Stainless Steel Bread Bin", not only do your goods stays fresh longer, but you actually give your kitchen a nicer and tidier look. Roll-up door easily slides open and close for a fast and wide access to your items. --- 100% Quality assured!!! --- It is made of high quality 18/0 stainless steel and beautifully compliments any kitchen decor and counter top. --- Dimensions --- 16.5" width x 10" length x 8" heights. 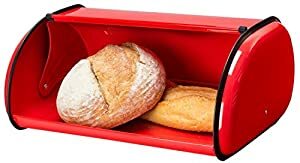 Made to store 2 loaves of bread or many rolls and buns and keep them fresh for a longer period of time. Made of high quality 18/0 stainless steel with black plastic frame. Door smoothly slides open and closed. Small holes at back allow air to circulate to prevent mold. Dimensions: 16.5" width x 10" length x 8" height.